On An Overgrown Path: Does anyone else sense a coded message? Does anyone else sense a coded message? A few days ago I pointed out that the BBC Buzz Proms feed, which was featuring links to some robust posts On An Overgrown Path, had stopped updating. Despite my article the page has now not been updated for ten days. But the BBC online and technology team, who understand social media somewhat better than their Radio 3 colleagues, have chosen to feature my story about the updating glitch on their own web page. Does anyone else sense a coded message? 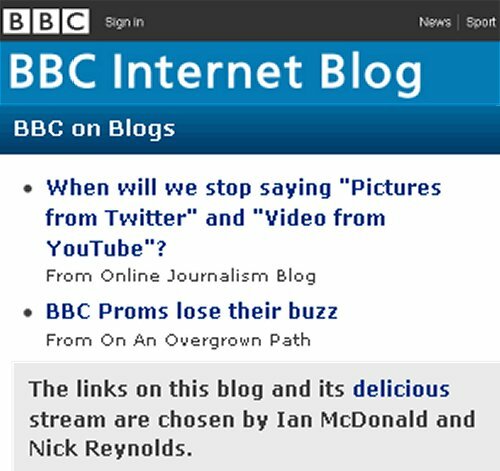 * Ian McDonald is the content producer, BBC internet blog. 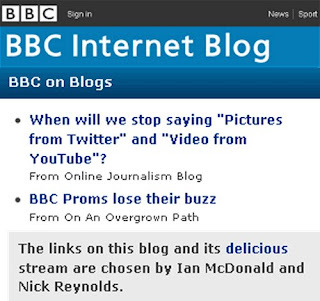 Nick Reynolds is editor of the BBC internet blog. I forwarded the email you sent me about the lack of Buzz on the BBC Proms pages to the relevant technical team. This is a technical problem which they were already aware of and are fixing. The Radio 3 twitter account is run by a separate team in a different part of the business. So there’s no inference to be drawn from the fact that one is working and the other isn’t. It’s just a coincidence. There is no “coded message”. Ian and I select links for the blog and it’s associated delicious and twitter accounts on the basis of editorial relevance i.e. will our audience find them interesting. If they raise issues that we think someone else in the BBC needs to know about, we also let them know. Nick, thanks for promptly and openly clarifying what is happening with the BBC Buzz Proms feed. It is disappointing though that a key social media feed to the Proms site can be down for currently eleven days and still counting. "The use of social media has increased enormously since the 2010 Proms and it will be fascinating to see how it develops throughout the summer. Do please go to our newly refreshed Proms website and make the most of its interactive offers. There is a much more dynamic home page and I look forward to reading your reviews of the concerts." It is also unfortunate that Radio 3 has continued to update the Proms website with self-serving quotes from the social media while the feed that provides a more balanced range of views is inoperative. And given Radio 3's awareness of the importance of social media one would have thought that a written acknowlegement of the problem on the Proms website, which is updated daily, would have been a priority. No coded message, but definitely several more self-inflicted shots through the foot by the BBC.